If you are looking for an affordable way to upgrade and update your floor on a budget, vinyl flooring might be the perfect choice for your home. 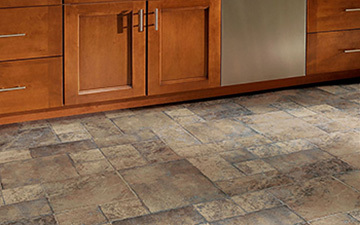 Forget what you thought you knew about the old type of vinyl flooring. We have a top quality selection of patterns and styles to match any decor. Before you start shopping your flooring options, take a look at some of the benefits of choosing a vinyl floor. It is a versatile flooring material with a number of benefits. If you are looking for a soft and warm flooring surface, vinyl absorbs the cold and is very comfortable to walk on. Since the vinyl is water resistant, it maintains a new looking appearance longer and is easy to clean and maintain. 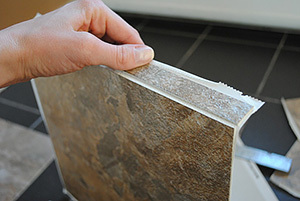 It is a durable option for rooms such as the bathroom, kitchen or basement or any room that might be exposed to moisture (which can damage other types of flooring). An interesting fact about vinyl flooring is that it is constructed from layers with the pattern and color repeated under a top coating which is scratch and water resistant. What this means is that vinyl floors resist fading and discoloration, giving you years of satisfied use. Are you thinking of selling your home? One of the best investments you can make is to upgrade with a new floor that buyers will appreciate. It is the quickest way to update your home with a fresh new look. We have a number of economical styles and colors to choose from. There is a large variety of available vinyl flooring options with photorealistic patterns that mimic wood or tile flooring or solid colors. The ability to easily (and affordably) combine more than one type of flooring (wood and vinyl) in larger spaces can help keep your new flooring within budget while giving you a designer look for less. We change our stock frequently and offer end of stock discounts and sales. Let us help you find an affordable flooring option.